Ruth I Johns was asked to research and write this book. Family First was on the front line of social change for over 40 years. Set up to challenge prejudices and tackle problems of the 1960s, it created innovative practical opportunities for families and individuals: in housing, child care, neighbourhood centres, learning skills, access to furniture and clothing and – above all – self-determining a positive future. 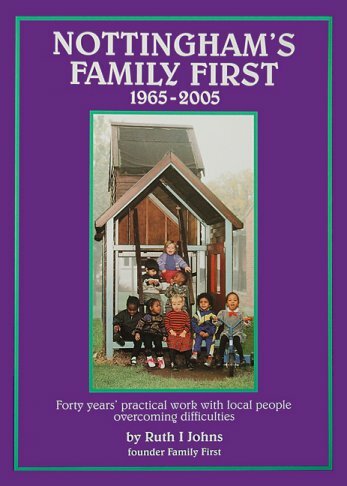 Family First was always a local organisation helping local needs. Its proven work altered attitudes both in the UK and abroad. Its early housing project for young lone mothers was called a ‘revolutionary idea’ by the Home Office. Family First’s holistic approach enables flexible practical help whether an individual was a young lone parent; a 60-year-old who left a long stay psychiatric hospital to live ‘in the community’; someone unemployed for many years; a young person leaving statutory ‘care’, or a parent desperate because of a family trauma. Like many small ‘appropriate’ organisations, Family First faced increasing bureaucratic regulations and an ever-changing barrage of policy impositions which favour the big players. This book – an historical case-study – shows how it is becoming more difficult to deliver the holistic help people need in order to become self-responsible, and to escape being defined as a tick-box category. (Also see Family First section). The Gulbenkian Foundation asked Ruth I Johns to write an earlier book about Family First. This covered its first ten years: philosophy and practice. See Backlist section. This is an educational read filled with examples for anyone involved in community work.